Are you watching a pantomime or nativity play this Christmas time? 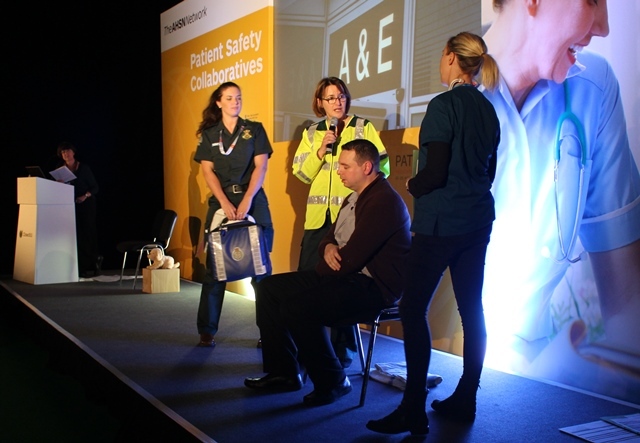 Spare a thought for our patient safety team who put on their own production of a patient story at the Patient First conference in London in November. The team performed What About Bobby? to a packed audience of over 200 attendees who heard how NEWS (the national early warning score) and the deteriorating patient collaborative have been improving care for patients across the region. Reviews were very positive with one audience member commenting: “Congratulations, I thought you guys did an amazing job and your presentation was very entertaining and a great way to get the information across.” Keep an eye out for the video of our production in the new year. 3-Threat, 5-Refer, 7-Severe are three levels on the NEWS score, which we use locally to prompt actions for escalation and provide a common language across all services. ​For people who are normally well, at a score of 3, there is a threat the patient might deteriorate. At score 5 the patient needs a referral for urgent medical review and hourly observations, and at 7 the patient is severely sick and needs continuous monitoring. Download our GP information sheet which explains why NEWS matters to your patient and find out more of the work of our collaborative here.